JOY is on a mission to reinvent how parents share time with their children. No more stress, no more power struggles. Only precious moments spent focusing on what really matters: quality family time. 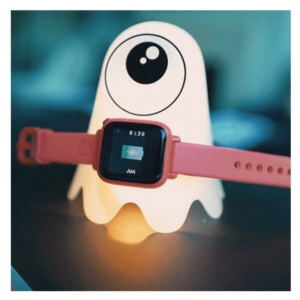 With the Octopus Smartwatch they want to make sure to improve both children and parents lives, with effective learning! The Training Wheels for Good Habits. 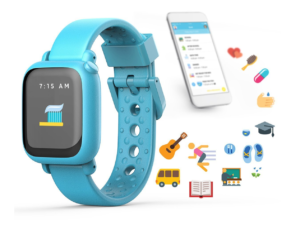 The Octopus Watch by JOY is the first icon-based watch that empowers kids by teaching good habits and the concept of time. The Octopus links time to events through icons (700+), making it the first clock that young kids can actually read and understand. The watch and scheduler is the perfect assistant in helping parents prioritize expectations and stay consistent with daily routines. Available in a strawberry red and sky blue model! The Octopus JOY Bundle features the same Octopus Watch but now with the Companion Night Light! With this bundle you can program the set as a customizable alarm clock, light and a charging station! The USA JOY online store unfortunately does not offer international shipping. Not to worry though! Big Apple Buddy, your personal shopper, can help you buy products from the USA JOY online store and ship them to your doorstep, no matter where you are in the world. We offer international shipping to over 110 countries including Australia, Austria, Azerbaijan, Bahrain, Belgium, British Virgin Islands, Brunei, Bulgaria, Canada, Chile, Costa Rica, Croatia, Czech Republic, Denmark, Estonia, Fiji, Finland, France, French Polynesia, Germany, Gibraltar, Greece, Greenland, Hong Kong, Hungary, Iceland, Indonesia, Ireland, Israel, Italy, Japan, Jordan, Kuwait, Latvia, Liechtenstein, Lithuania, Luxembourg, Macau, Malaysia, Maldives, Malta, Marshall Islands, Mauritius, Monaco, the Netherlands, Netherland Antilles, New Zealand, Norway, Oman, Poland, Qatar, Romania, San Marino, Saudi Arabia, Serbia and Montenegro, Seychelles, Singapore, Slovak Republic, Slovenia, Spain, South Africa, St. Lucia, Sweden, Switzerland, Taiwan, Thailand, the UAE, the UK, Vatican City, and Vietnam. If you would like to buy from the USA JOY online store, simply let us know which items you would like to order (by filling out the form below) and we’ll get back to you with a free international shipping quote within 24 hours!